(Bloomberg) -- Joe Biden responded to a former Nevada lawmaker who’s gone public about a incident in which she says the then-vice president acted inappropriately toward her, as a new poll showed the 76-year-old is the most palatable candidate for Democratic voters in 2020. Lucy Flores, a former Nevada assembly member, said Biden smelled her hair and delivered “a slow kiss” to the top of her head at a 2014 campaign event when she was running for state lieutenant governor. In a statement released on Sunday, Biden said he had “offered countless handshakes, hugs, expressions of affection, support and comfort” during his years in public life. Still, Flores’s allegation put many Democrats in a bind regarding an elder statesman in their party and potential 2020 White House candidate. Flores has served in the past on the board of directors of “Our Revolution,” a political action organization spun out of the 2016 Sanders campaign for the Democratic nomination. 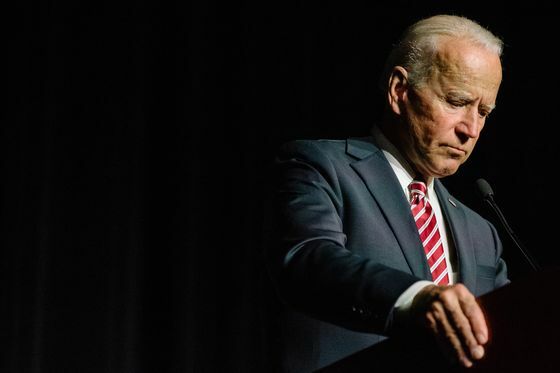 Separately, an NBC-Wall Street Journal poll released on Sunday showed Biden, who’s yet to formally announce a presidential bid, is the most palatable among well-known Democratic candidates at the moment. A combined 73 percent of Democrats say they’re either enthusiastic or comfortable with Biden as a candidate, while just 25 percent either have reservations or are uncomfortable. That put Biden ahead of candidates with more progressive policy proposals, including Senators Bernie Sanders of Vermont and Elizabeth Warren of Massachusetts. The survey was conducted March 23-27, before Flores’s comments came to light on Friday in an article for New York Magazine’s “The Cut,” The margin of error for 1,000 adults surveyed was plus or minus 3.1 percent.